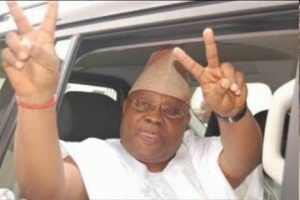 The Osun State Governorship Election Tribunal has declared the candidate of the Peoples Democratic Party (PDP), Senator Ademola Adeleke, as the winner of the Sedptember 2018 governorship poll. The tribunal made the declaration after dismissing a preliminary objection against the petition of the PDP and Senator Adeleke, challenging the outcome of the election in the state. Delivering a ruling on the preliminary objection, Justice Peter Obiora who is a member of the three-man Tribunal held that the petition was competent. He held that the tribunal has the jurisdiction to hear and determine it. The judge ruled that there was merit in the appeal filed by the PDP and Senator Adeleke, adding that the declaration and return of Governor Oyetola by INEC was null and void. He, thereafter, declared Senator Adeleke, who represents Osun West district at the National Assembly, as the winner of the election and duly elected governor of the state. The judge also held that the Certificate of Return issued to Governor Oyetola be withdrawn and that a fresh one should be issued to Senator Adeleke of the PDP, having fulfilled the conditions of the law. He said the petitioner scored the lawful majority votes at the election while the re-run held in the seven cancelled units were null and void and of no effect. In a dissenting judgment, the chairman of the Tribunal, Justice Ibrahim Sirajo, held that the petitioner could not prove substantial non-compliance with the Electoral Act in the election. He observed that an election Tribunal, under Section 140(3) of the Electoral Act, lacks the powers to declare a winner where such was proved. Justice Sirajo insisted that they can only declare a supplementary election or a fresh election, and not to make a declaration. Justice Obiora and Justice Ayinla Gbolagunte, however, entered a majority judgment in favour of Senator Adeleke. After hearing final arguments and adoption of written addresses by lawyers to the parties involved on March 7, the tribunal announced that it would reserve judgment on the matter.